Colorectal cancer (CRC) is the second most commonly diagnosed cancer in men and the third in women in South Korea . Moreover, CRC incidence in South Korea is increasing at a rate of approximately 6% per year . Notably, metastatic status, including locoregional node-positive at newly diagnosed CRC, has been reported in 57% of CRC patients . Due to high oxygen requirements of rapid cell proliferation, solid tumors, such as CRC, often contain hypoxic regions and structurally and functionally unusual intratumoral blood vessels . Intratumoral hypoxia induces the accumulation of hypoxia-inducible factor-1α (HIF-1α), a protein that is rapidly degraded by the ubiquitin-proteasome system under normoxic conditions [3, 4]. HIF-1α plays a key role in tumor progression, therapeutic resistance, invasiveness, and metastasis [5, 6, 7]. In the initial stages of metastasis, cancer cells separate from the main tumor sites, migrate, and invade the surrounding tissue, i.e. lymphatic and blood vessels. During the epithelial-mesenchymal transition (EMT), epithelial cells lose their cell-cell junctions and polarity, acquiring migratory and invasive abilities and displaying mesenchymal cell phenotype . EMT is an important cellular event that enables malignant cells in the primary tumor to invade other tissues and metastasize [8, 9]. Importantly, EMT is mainly triggered by tumor hypoxia [7, 8]. Korean Red Ginseng (RG) (Panax ginseng Meyer) is commonly used in Asian traditional medicine to treat various diseases . Two-thirds of cancer patients in Korea take dietary supplements; of these, 50% have reported taking an RG product [11, 12]. Korean RG extract (KRGE) has long been used in tonics and rejuvenation remedies . 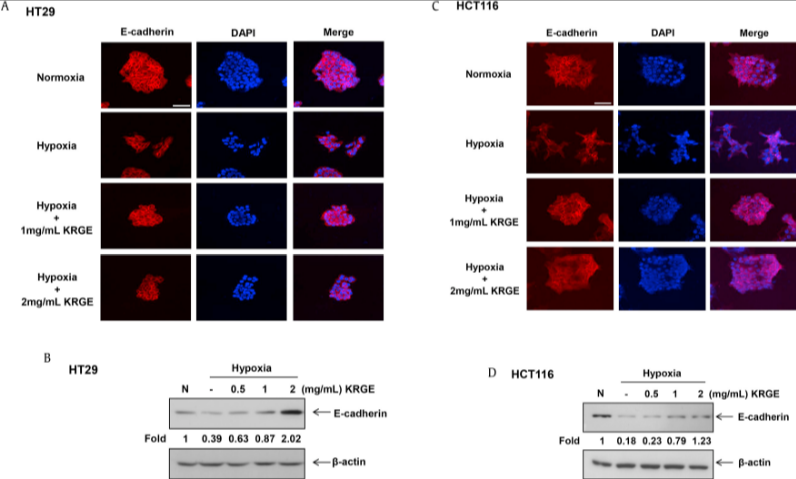 Although beneficial anti-cancer activity of KRGE has been reported in vitro and in vivo, detailed molecular mechanisms of the anti-tumor effects are not well understood [14, 15, 16]. Although a few studies have reported detailed molecular mechanisms of anti-metastatic effects of KRGE in CRC, the effects of KRGE on the EMT process in CRC metastasis are unknown. Therefore, the aim of this study was to evaluate the effects of KRGE on hypoxia-induced EMT in CRC cell lines. Toxicity to healthy cells often limits the clinical utility of chemotherapeutic agents. 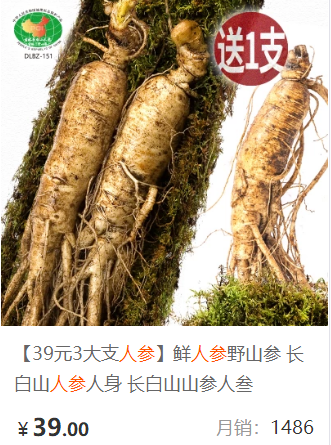 As natural products, such as ginseng extracts, may present anti-cancer activity with reduced toxicity, it is important to elucidate the anti-cancer effects of KRGE. 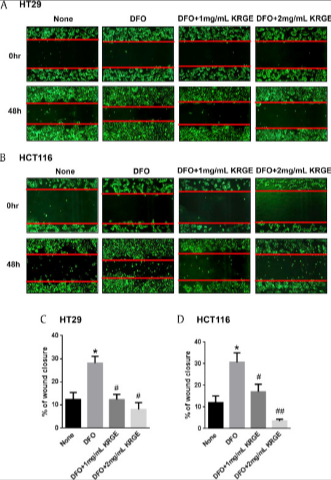 In conclusion, KRGE inhibits hypoxia-induced EMT by repressing the activation of NF-κB and ERK1/2 pathways in colon cancer cells and may be potentially beneficial in the treatment of colon cancer.